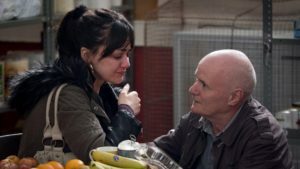 Ken Loach directs the off-kilter comedian Dave Johns in “I, Daniel Blake,” a beautiful depiction of healthcare and bureaucracy in England. Daniel (Johns) suffers a heart attack and wants nothing more than to go back to work, but due to the State’s red tape and edicts regarding fitness to return, he winds up fighting the system in order to receive his deserved Employment and Support Allowance. It’s a familiar exercise in frustration not limited to healthcare abroad, but the story delves more deeply into humanity as Daniel befriends a young, single mother trying to make ends meet…by any means possible. The two work through their situations with the support from one another—a father-daughter type of relationship—reminding us all about the importance of connections and love. Johns’ portrayal of Daniel is extraordinary. He easily represents a man who has worked hard all his life, but in the end, the lack of what he has to show in tangible form is disheartening. Johns creates a character who is complexly beautiful on the inside. His performance in frustration and acting out appears to be one that he identifies with readily, allowing viewers to immediately connect with him. While the dialogue is frequently light, what is said visually is loud and clear. He also creates a fatherly connection with Squires who demonstrates what many single mothers must experience. Together, they are an absolute delight as we invest our energy in needing to know how things end. Shann is exceptional as Daisy. 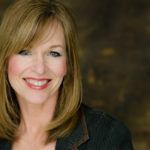 Finding child actors who understand the situation that they are in and who they must portray is exceedingly difficult, but Shann is a natural. The talent of screenwriter Paul Laverty to tell such a seemingly simple story with touches of humor and irony, bringing out the subtle but poignantly significant aspects of life to the forefront is genius. With Loach directing the talented actors, it’s no wonder there is an immediate attachment to each of the characters. 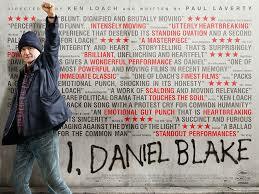 “I, Daniel Blake” is a film that tells a familiar and meaningful story, reminding us of how important we can be in one another’s lives if we take the time to look. Films like this resonate personally with us and stay with us long after the final credits roll.